STA -LEVEL - audiolounge-pros Webseite! The Retro Sta-Level is a replica of the legendary 1956 Gates Sta-Level. The Retro Sta-Level is a replica of the legendary 1956 Gates Sta-Level. The Sta-Level dominated the sound of hit radio in the 1960's. 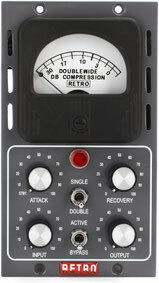 Now these super musical sounding compressors have found their way into today's hits. The Retro Gold Edition celebrates fifty years of the products existence. The Sta-Level uses the coveted 6386 tube in a classic G.E. circuit design. Alternatively, the Gold Edition Sta-Level uses a pair of commonly available 6BJ6 tubes (stock). The customer has the choice to use their own 6386 they provide or the 6BJ6 provided with the purchase of the unit. The choice is yours and the sound is undeniably true to the original either way. Origin The original 6386 compressor developed by G.E., utilized a novel program controlled release circuit. The Sta-Level implementation creates density and consistency while minimizing typical compressor side-effects at up to 40dB of gain reduction! The program path is transformer balanced throughout to cancel control-induced distortion. Push pull circuitry with 6V6 output stage provides wide voltage swing for gain control and line output. The result is that the Sta-Level brings a uniquely familiar intimacy, air and warmth to your tracks. Revisions Revisions to the original design include; Tube balance can be instantly aligned without test equipment; Uses 6386 tube or a pair of 6BJ6 tubes; Two or more Sta-Levels can be coupled together for stereo, surround or sidechain operation; XLR transformer balanced input and output; IEC Power Connector; Hand matched audiophile-grade coupling capacitors; High quality, custom wound transformers used throughout; Internal component safety cover.